There’s something undeniably endearing about watching an animated bear shove his entire face inside a honey pot, no matter your age. During one scene in Disney’s Christopher Robin, Winnie-the-Pooh gleefully slurps up the sugary substance on a kitchen table, entering a state of drunken nirvana as he devours a food — er, condiment — he eats for every meal. And yet, it’s as if Pooh has tasted honey for the very first time. That kind of fresh perspective on life, and an ability to find bliss and new possibilities even in the most ordinary or gloomy of circumstances, is part of what’s given A.A. Milne’s lovable tales such enduring magic over the years. Luckily, Pooh’s sense of wonder and innocent jubilance isn’t lost in Disney’s live-action/animation hybrid from director Marc Forster (Finding Neverland), but it’s unfortunately in service of a predictable story with so little to say. In Christopher Robin, written by Alex Ross Perry, Spotlight‘s Tom McCarthy, and Hidden Figures co-writer Allison Schroeder, Ewan McGregor plays the grown-up version of the boy with the vivid imagination. After going off to boarding school and then off to war — shown in a montage cutting between live-action scenes and E.H. Shepard’s book illustrations — Christopher hardens into a beleaguered father and husband consumed by his job. The London luggage company he works for is in dire financial trouble, and tasked with saving it, Christopher must skip his family’s weekend getaway to crunch numbers and find a way to avoid lay-offs. “This is your life, it’s happening right now in front of you,” his wife Evelyn (played by a warm Hayley Atwell who’s given awfully little to do) fires back when he shares the bad news. But not even his frustrated wife or disappointed daughter (Bronte Carmichael) can help him see what he’s missing; that’s what Pooh’s for. Anyone who’s seen Hook can guess what happens next; it’s the imaginary friends who help the over-worked, weary adult reconnect with his childlike spirit. Forster’s film has more in common with the Steven Spielberg movie than his own Peter Pan origin story Finding Neverland, with McGregor’s Christopher following a similar trajectory to that of Robin Williams’ pragmatic, workaholic dad. After Christopher spills a jar of honey on an old drawing, Pooh (Jim Cummings, who’s voiced the bear since 1988) magically wakes up, walks through a door inside a tree and bumps into his old pal on a park bench. The two share a brief, sweet reunion (emphasis on sweet as there is a lot of honey involved), but soon a stressed-out, aggravated Christopher rushes to return Pooh home so he can get back to work. Along the way, of course, Christopher’s Hundred Acre Wood pals help him realize the importance of family and happiness, all while saving the day at work. It’s all far too simple and predictable to strike any genuine emotional chords, but for a moment there, I was really hoping Christopher Robin would be the next Pete’s Dragon. I found myself thinking about David Lowery’s 2016 live-action Disney film a lot during Christopher Robin, wondering what his version of the story would look like. Maybe it’s because shots of the golden bear’s arms brushing through a grassy field at twilight gave off serious Terrence Malick vibes, much like Lowery’s work does. Maybe it’s because Forster’s film is surprisingly melancholy, both tonally and visually, edging towards more mature territory than the average family fare. Forster and cinematographer Matthias Koenigswieser use a desaturated color palette throughout — Piglet’s pink and Tigger’s orange are much more muted than the vibrant animations of your childhood — giving the film an air of gloominess that Eeyore would appreciate. That’s not exactly a poor choice; I was all for it at the start of the film, hoping such moodiness would give way to a narrative full of profound insights. It could be a chance to tell a story about the loneliness that can plague children and fester into detachment and isolation in adulthood. But instead of digging into anything weighty, Christopher Robin ends on too simplistic a note and fails to justify all that dourness. With screenwriters like Perry, McCarthy, and Schroeder, I expected something much richer and more thoughtful than what we ultimately got. Though when we escape the uninspired family plot for the imaginative world of the Hundred Acre Wood, Christopher Robin offers up enough pleasures to make the trip worthwhile. It’s the anthropomorphic toys that bring the movie to life, from the gorgeous CG animations to the voice performances that are as tender and emotional as they are fluffy and funny. It’s startling how photo-real the characters look, from the way the CG fabric stiffens and folds at the back of Piglet’s neck to how Pooh slightly swivels as he walks on his toy legs. It never feels like we’re simply watching animated toys, either; the expressiveness of Pooh’s eyebrows alone is nearly enough to make you tear-up. That in itself highlights the biggest weakness of the film: a bunch of stuffed animals are more lively and relatably human than the actual humans. Something that made Milne’s stories and the animated adaptations that followed so adored and special for children and adults alike was how Pooh could turn the most rudimentary comment into a sagely observation. He may have called himself a bear of little brain, but he had a way of looking at the world in a clever light and treasuring the more optimistic sides of things. 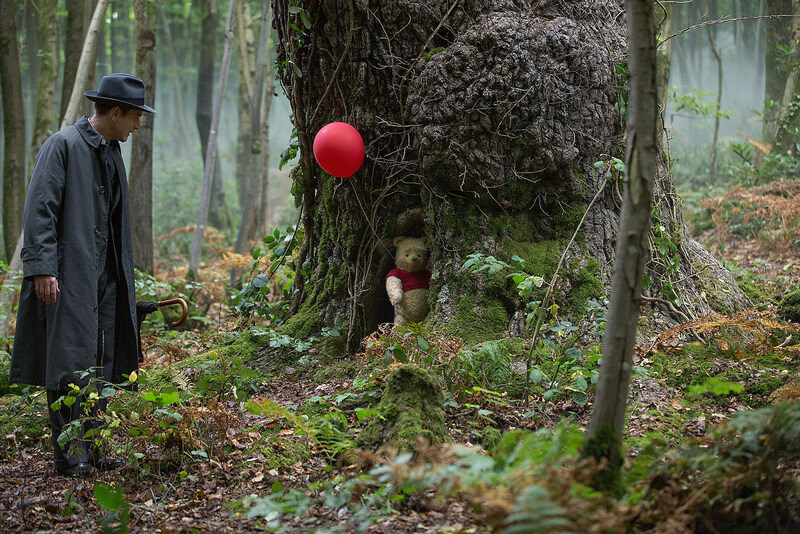 There may be plenty of charming, classic Pooh-isms sprinkled throughout Christopher Robin, but the film just can’t manage to bring the same level of poignance and wisdom to its own story.